Before you invest in a web video, make sure you’re clear which video marketing strategies you’re working towards. … Does that sound familiar? Chances are you’ve heard plenty of folks saying things like that to you. I know I’ve heard plenty of such statements! More than 1 billion unique users visit YouTube every month. 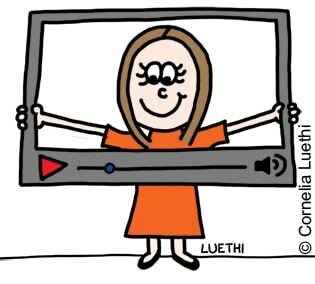 It’s little wonder that business owners and marketers are so excited about video marketing: video is huge! Whoa, wait a mo before you jump on the video marketing bandwagon! Before you jump on the video marketing bandwagon, it’s important to consider where the wagon’s heading, and how much the wagon ride will cost you. After all, video marketing represents a reasonable investment in either time (if you DIY) and/or money (if you hire professionals), so it’s worth giving your goals some thought before you get started. I’ve seen too many business owners get all enthusiastic about video; make some random videos (based on the first ideas that popped into their head) without any clear thoughts on objectives… and then claim that “video marketing didn’t work” because they had no clear measures or goals in place. Duh! So rather than making that kind of expensive and disappointing mistake, ask yourself what you want to achieve from your video marketing. Go through this list, and see which of the following video marketing strategies would be most helpful in your business. Or in other words: What do you want to achieve? Type of video: This is where you make a personal introduction in the video, and briefly explain your product or service. This should take no longer than a minute. Bonus benefit of using this kind of video: This video selects-in your target customer, but will help to weed out the personality types you’d probably clash with. If you are a single-person service-based business, this can be gold! Example of an intro video: I use an intro video on my Words By Cornelia copywriting website – it’s at the top of the right-hand side bar. Type of video: This is where an overview is provided, either by yourself, a colleague or an actor. 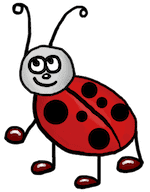 Alternatively, an animation-style video can be used. Bonus benefit of using this kind of video: Video can help explain complex things in simple terms – and very quickly. You’ll often see these sorts of videos for software services, for example, and you get a quick demo of how the software works and what the benefits are to the user. Some things are simply easier to explain by demonstration rather than in writing… so using this type of video can increase your sales, whilst lowering the work burden of your sales team or customer services team. This kind of video also works well for businesses where your customers visit your premises: it lets them know what to expect, and can help take the fear out of going somewhere new. It’s also a great way to highlight your company’s culture, and really bring your uniqueness to life. The viewers may be prospects, who are in research mode, and the video can boost your sales conversion rates. Or if your existing customers can also watch the videos, it can reinforce your expertise and help prevent your customer from going to another supplier. It’s a great value-add to a business relationship. Bonus benefit of using this kind of video: This kind of video can also help to minimise complaints and refunds if people understand your product or service better. Plus you can also use the videos on your website, blog and newsletter: one video = many opportunities to use it! Examples of how-to videos: This is the kind of video I’ve been making, and I’ve been using the videos on my blogs as well as on my YouTube channel. Type of video: Sales videos, whereby there is a single call-to-action – which is usually to buy a product or service online. Sales videos can vary enormously in length: some are just a few minutes long; others can be an hour or longer! It depends on your product or service, your offer, your sales technique, and more. You can read some facts about video lengths and drop-off rates here. In the internet marketing world, video-based sales pages have been outperforming copy-only sales pages for some time now. I tested this myself earlier in 2013, when I launched a new eBook. I ran a split test, whereby 50% of website visitors saw a copy-only sales page, and the other half of website visitors saw the exact same page – but with a video added, right at the top of the page. The copy-only page converted at 6.98% and the sales page with the video converted at 16.67%… so yes, video marketing can and does work. Note that that was my very first sales video, so it is a bit rough in terms of content, production and editing (I had to get the entire thing finished in a weekend! ), but I’m pretty happy with that! 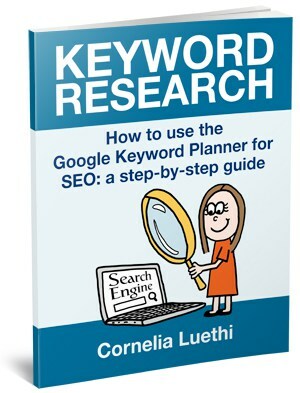 You can see this warts ‘n’ all sales video on the sales page for my Keyword Research eBook. Bonus benefit of using this kind of video: If your video can keep viewers engaged for a reasonable length of time, you can go into quite a bit of detail about your product or service and how it works. Provided you don’t overstate or exaggerate the benefits, this could mean low refund rates and minimal complaints. Type of video: This would generally be a “how to” video, or a quick tip of some kind. 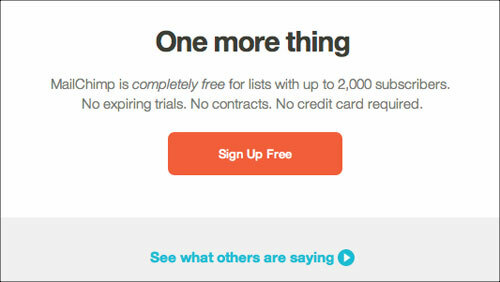 In other words, something interesting to entice potential subscribers to sign up for more. Whatever kind of video you use, you’ll need to add a call-to-action for viewers to subscribe. However, do not rely on YouTube, as YouTube viewers are unlikely to click through to your website. That means using some other kind of video hosting service – usually a paid-for service. I personally use Easy Video Suite, but there are many other options out there, such as Wistia, Vimeo, Viewbix, and more. You’ll need to figure out for yourself which service best suits your needs, your strategies – and your budget. Bonus benefit of using this kind of video: This kind of video can also help with the “demonstrate expertise” strategy. If you plan you video marketing strategy well, you can use one video to achieve multiple tactics. Type of video: Theoretically you can use any kind of video here, but a “how to” type video would be ideal. However, it takes more than just uploading a video to YouTube, and/or embedding it on your website. You see, Google can’t actually ‘see’ inside videos, so they rely on Meta data (behind-the-scenes data). 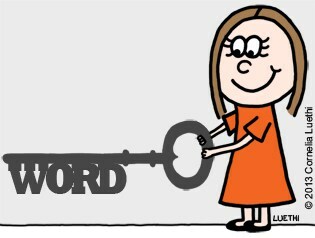 This should include the keywords you’re targeting, based on keyword research. This video Meta data is called ‘schema.org markup’ and is supported by Bing and Yahoo, as well as Google. Thumbnail (i.e. the graphic that represents the video’s content). While only a few properties are required, providing additional information helps Google understand your video and enhance its appearance in search results. You should also upload a video sitemap, and if there’s an opportunity to add a transcript, make sure it includes keywords. Bonus benefit of using this kind of video: This type of video can help you achieve other video marketing strategies too. For example, you could demonstrate your expertise, or encourage conversions. Your call-to-action could be to encourage a purchase, or to grow your email subscriber list. Pitfall to be aware of: Using YouTube is a double-edged sword for SEO. If you use YouTube, yes, your videos are likely to show up on Google. But it will be YouTube getting the website traffic, NOT your website. You will need to use an alternative video hosting service if you want to get the traffic to your own site – but you may not get the same amount of search engine exposure as you’d get with using YouTube. Remember, Google owns YouTube, so Google will do what’s best for their business, which may be incompatible with your own goals. You’ll need to figure out the best solution for your business goals. And now that you’re aware of the different video marketing strategies you can use, you’ll get a clearer picture of the tactics to follow. “Building awareness” is a very vague objective: after all, how would you measure this? I’d recommend choosing a video marketing strategy that’s a bit more specific and measurable. This kind of vague strategy might be OK for a large corporation with vast budgets, but it’s a different story for small businesses that need to see a return on their marketing investment. “Going viral” is a very high risk goal. After all, everyone wants their offering to “go viral” yet only a tiny percentage of videos do go viral. Besides, “going viral” doesn’t necessarily equate to earning lots of money. I bet that the owners of most of those funny cats on YouTube aren’t millionaires – or even close. Instead, I think it’s far better to have a more realistic and measurable target than “going viral”. Just because “going viral” is one of today’s buzzwords, doesn’t mean that you should aspire to do it. Scripts: Video scripts need to be written in such a way to achieve the strategy you’ve chosen. The script needs to be well-paced: not to slow and not too fast. 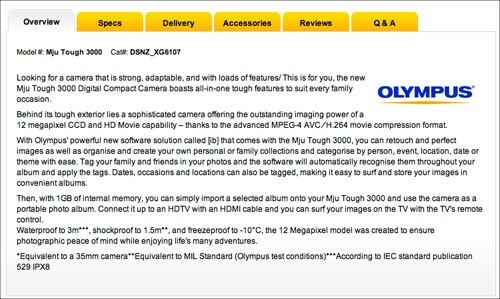 Reasonable production values: This means things like the video/picture quality; audio; and lighting. You don’t need a mega budget for this, but it is important to do it properly, if you’re thinking of going down the DIY route rather than engaging professionals. Video editing: Video editing is time-consuming, yet it can make the difference between a so-so video, and an awesome video. Unless you’re prepared to spend some time (and money) on learning how to do this, you might want to consider outsourcing this. Video hosting: You’ll need to find the best way to host your videos. Whilst YouTube is convenient (and free), it does have a number of drawbacks, so it may not be the best solution for your business. The technical side of video marketing is a whole separate topic. But at least now you’re clear on how video marketing can help you in your business. Congratulations on considering the strategy first, rather than jumping straight into the technical nitty-gritty side of things. Based on my experience, this will most likely put you a step ahead of your competitors! Most small businesses dive right into the tactical stuff without considering the bigger picture – or rely on a local videographer who may be great at making videos, but not so good at actually delivering results that contribute towards business goals. So yes, figure out which video marketing strategies align with your overall marketing goals – and then implement video marketing so it delivers tangible results to your business. I’ll never understand why some companies make it so hard to do business with them. How do you feel about “CAPTCHA” forms? You know, those awful, illegible “words” that you have to type in on some websites (usually on enquiry forms). CAPTCHA stands for Completely Automated Public Turing test to tell Computers and Humans Apart”… or in other words, it’s a test to check that it’s a human filling in the website form, not an automated spam robot. To me, it seems totally rude to ask your website visitors to waste their time trying to interpret these frustrating eye-tests. I mean seriously, what next? Do prospects also have to jump through hoops of fire to contact you?! Nope, I have no idea what it says. They’re not even real words, for goodness sake! 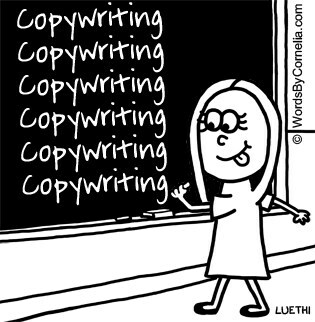 This was from a website that I had to use to fulfil a job for a copywriting client. Every time I hit ‘refresh’ the CAPTCHA had the same level of gobbledygook as this. And there was no audio version for people with hearing problems… it’s rude, rude, rude! Are you really that worried about spam? If you have a half decent email system, most spam will get filtered out automatically. I use Gmail (via Google Apps) as my email provider, and I’m really happy with the spam filtering. The supplier I used previously wasn’t so good, but personally I’d rather delete a few spam emails than make it so ridiculously hard for people to contact me. Disclaimer: I’m not a website programmer; I’m just repeating information my awesome web designer has shared with me. Instead of the “guilty till proven innocent” approach of CAPTCHA, there’s another method called the “spam honeypot” that seeks to trip up robots (not humans). Hurrah! The way it works is that a hidden text field is added to Contact forms. This field is invisible to human users, but the spam bots aren’t aware of this, so they will insert something into that form. The system then knows that this was a spammer, and you’ll never even see the spam. It is effective (and something that’s used on this website). So please, instead of using annoying, frustrating and rude CAPTCHA forms… ask your web developer to use nice and unobtrusive spam honeypots instead! Do you find that an out-of-the-blue interaction with a nice, friendly, cheery person can make you feel all smiley and glowy inside? That’s how I used to feel whenever I parked in my favourite multi-storey car park in Auckland CBD. For inside this grey, gloomy building was a cosy pocket of warmth – known as the payment booth. An elderly (and generously proportioned) Pacific Islander lady with white hair and a jolly disposition resided in this booth. It seemed that no matter which hour, or which day, I visited the car park, she was always there. And always knitting. And always ready with a big smile. In fact, I always used to look forward to paying for my car parking fee, knowing that the jolly Islander lady would be there! A sincere smile and chat with her made my day. One time I arrived at the car park to discover that the barrier arms at the entry at gone. And Pay and Display ticket machines had been installed. And – horrors! – the payment booth was covered in metal shutters. Ugh! For me, the whole vibe of the car park changed instantly. Instead of feeling safe, protected and looked after, it now feels cold, impersonal, and almost creepy. It’s the personal touch that can transform a routine transaction into something more pleasurable. Maybe even a relationship of sorts. We all know this, but in this world of computers and websites and email, many business relationships veer more towards the impersonal rather than personal, warm and friendly. Yet friendly faces make us relax, smile and feel good about ourselves! Wouldn’t you like a bit more warmth and friendliness in your working day? 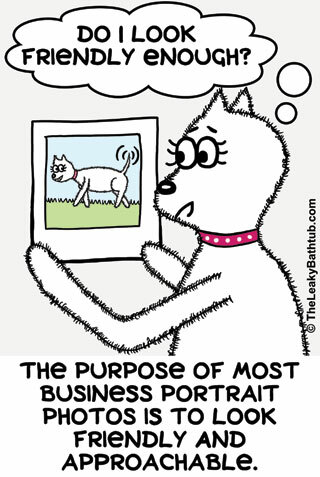 It’s easy… you use a portrait photo of yourself in your marketing communications! This is something I hear quite often from business owners. They think that they’re not attractive enough to use their photograph. Rather, it’s about you looking friendly, and approachable – and like you. That’s it. Nothing more and nothing less. Truly. So before I had my profile photos taken, I spent some time with my beautician and hairdresser in order to look the best I could. And the photographer I engaged was excellent: she specialised in portrait photos (she’d even won some awards) and I really liked the shots in her portfolio. How you pose in a portrait photo is important too, because the body language is so important. Here are my tips on how to pose for portrait photographs. In short: with a bit of preparation, you’ll end up with shots that you will be happy and comfortable using. You’ve got the photographs – now what do you do? The photographs are no good sitting on a CD or on the hard drive of your computer, oh no! You need to use them! Me personally, because I felt very uncomfortable about putting my photograph everywhere, I did it in stages. Putting your portrait photograph on your website immediately adds warmth and credibility – and builds trust. 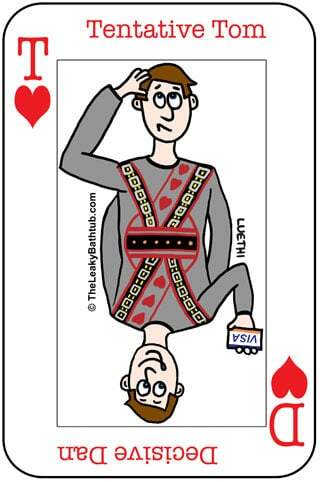 Visitors like knowing that there’s a real person behind the business: dealing with a faceless persona just feels weird. I must admit that I didn’t really think about how putting my photograph on my website would benefit or affect me. In fact, I wasn’t really sure what to expect – I didn’t think it would make a difference to me, only to my website readers. Wrong! After I started using my photo on my website, I’d notice that when I met prospects and new clients for the first time, they were noticeably friendlier to me! Not that people are normally unfriendly, but because these people had seen my photograph (and read about me), they felt like they already knew me a little. It’s a huge ice-breaker and rapport building tool! I’m shy by nature, so it makes a big difference to me when the person I’m meeting for the first time not only recognises me, but also approaches me with a big smile. It’s wonderful! I can’t remember who suggested this to me, but I was very uncomfortable about using my photo in my email signature. It’s not something that’s normally done in New Zealand, and it just felt a bit cheesy and attention seeking. But whoever told me to do it must have been very persuasive, because I did finally do it. And the results were very unexpected! I instantly received an email from an A-Grade client saying how much she enjoyed seeing my photo in my email. She said that it made her feel like she was communicating with a real person, and that it took the impersonal nature out of emails. Here’s an example of using a profile photograph in an email signature. The wonderful feedback from my A-Grade client gave me the confidence to keep using my photograph in my email signature. 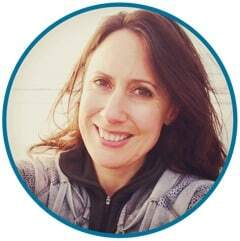 I’ve noticed that using my profile photo in this way is great for building rapport with new clients – just like it does on the website. That was one result I semi-expected, but I was in for another surprise. The surprising thing I’ve noticed since using my photo in my email signature is that the replies I receive are somehow… nicer. It’s not that I’d usually receive lots of nasty emails from people, no. But because people see my face when they’re writing a message to me, somehow their tone changes, just a little bit. Seeing my photograph makes people aware that they’re communicating with a real, live human. And this slight difference in tone makes a huge difference to my day. We all like to be addressed in a friendly, courteous manner, so this directly impacts my happiness at work. One thing’s for sure: I’m no longer scared or hesitant about using my photo! Other website pages: e.g. newsletter sign-up pages, download pages, etc. Email newsletters: This adds a personal touch to your mass communications. Business cards: This helps people to remember you long after the initial meeting. Proposal documents: Put a friendly, personal touch to quotes and estimates. Think about it from the reader’s point of view, who may find the document a bit scary and intimidating – especially if it’s a high-value purchase. Wouldn’t a friendly smile on the cover page warm you up to reading it? Sales letters: I’ll often include my photograph in sales letters to clients, as it adds that friendly, personal touch. In short: you can use your profile photograph in the same places where you use your digitised signature. Are there any places where you shouldn’t use your profile photograph? I do think that it’s possible to take the profile photograph thing too far. For example, a few years ago I received a fridge magnet for a mortgage broker with his photograph on. Do I want to look at his photograph every day when I’m making breakfast? Um, that would be a no! We also received a Shopping List pad from a husband-and-wife real estate team (people we have no relationship or connection with). That went straight into the recycling pile. While it’s good to use your profile photograph to build a relationship, there is such a thing as being too “in your face”, so some common sense is advised! Remember, the aim is to add a friendly, personal touch… not to freak people out! They trust your company/brand more quickly. It helps to put them at ease and makes them feel more comfortable… dealing with people whose names and faces you know is nicer than dealing with an anonymous entity (or a machine!). It can help to boost your sales conversion rates, or speed up the decision-making process, because your prospects trust you more (and do so more quickly). It’s a wonderful ice-breaker and rapport builder for meetings: people will feel like they already ‘know’ you, which puts both of you at ease. People may communicate with you in a more courteous manner. It is easy to be rude or vent to an anonymous entity than a person whose name and face you know! It differentiates your business and your brand against your competitors. There is no competition to be you! Imagine for a moment that you’re selling your house, and your real estate agent has just organised the first Open Home. It’s exciting, and nerve-wracking. You’ve spent days cleaning and tidying and doing those little maintenance jobs to make a good impression. After all, you want the visitors to fall in love with your home, just like you did when you first saw it! You’d be horrified! Embarrassed! Disappointed! Wondering what on earth went wrong! What if you have a similar problem with your website? 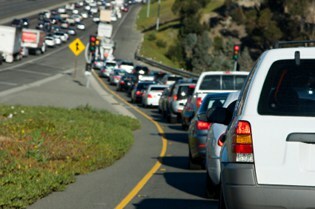 What if your website visitors aren’t staying? What if they’re leaving your site without making an enquiry? Or without buying anything? If you’re not making any online sales, chances are that your website visitors are hitting the ‘back’ button on their web browser and going to your competitors instead. Horrors! How do you keep your website visitors on your site – and encourage them to buy from you? Getting your website visitors to hang around is all about building trust – and quickly. 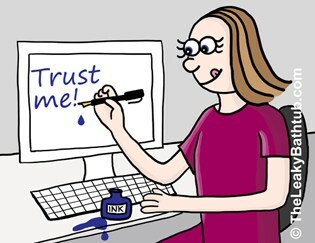 So how do you build trust on your website? Isn’t it time you found out which simple tweaks could help you get better results online? Wouldn’t you prefer it if you could grow your website’s sales and enquiries levels – instead of your prospects going to your competitors? Find out more details at this page and judge for yourself! 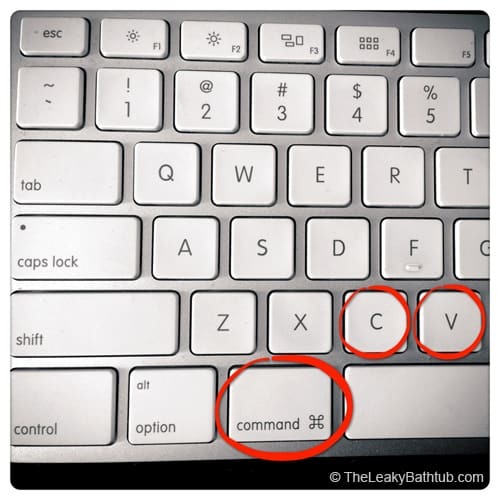 Cornelia Luethi at The Leaky Bathtub wants you to stop being confused about website jargon, so you can start getting better results online. The bonus is my very own tool that I’ve developed to help you with that. Adding your signature onto your website is a simple way to build trust – and quickly. Do you remember the last time you had to sign a document? It may have been a contract, or a form, or something authorising a payment (e.g. a cheque or Direct Debit). Signing your name makes something feel quite official, yes? Even if you didn’t read all the small print in detail, you just know that when you sign something, it had better be correct. You know for sure it’s something serious and binding. What does signing your name have to do with websites? Websites are tricky beasts, in that a potential prospect will decide in 7 short seconds whether they’ll read your site further, or if they’ll hit the ‘back’ button on their browser and go to a competitor’s site. Therefore you have mere seconds to communicate that your business is trustworthy and reputable. Adding a signature to your website is one of the tools you can use to help with this: it’s a powerful, visual way of building trust. There is a real person behind the business. This person is willing to sign their name to what they say… which in turn ads gravity to what it says on the website. … and it does these things within a very short space of time. What’s more, a signature is also very unique. A signature can even become a brand element that will let your business stand out against your competitors. It’s a very powerful branding tool – and also a very inexpensive one! Signature on website example: Notice how the signature adds a friendly and personal touch the website. Do not use your “official” signature, e.g. 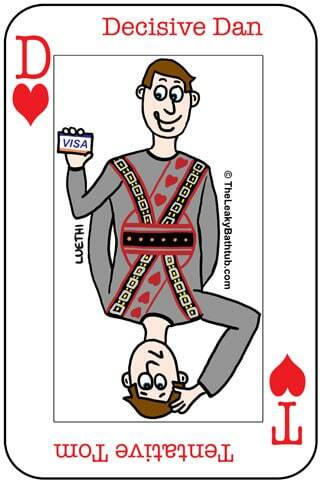 your credit card signature! Use a good quality, black pen. My personal preference is for a pen with gel ink, or a fountain pen, as this makes a good, solid line. Ball point pens don’t have a smooth ink flow, so the result can look blotchy. And a thick pen (like a marker pen) will look too chunky and overbearing. Not recommended: JS, J Smith. You’ll need the signature in a JPEG or PNG image file. Make sure the black is nice and crisp; the white background clean. If necessary, rotate the signature so that it is level. Then save your signature in a website friendly format. Your signature graphic should be a small file size, so it’s quick to load, but still good quality so that it looks crisp and sharp. 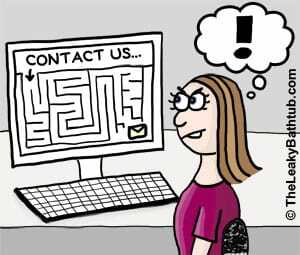 Contact us page, as it is important to humanise this page: all too often, Contact Us pages are very abrupt and not very compelling! Adding your signature – and your photo – makes the “contact us” message more personal and thus it’s more enticing for prospects to contact you. Underneath your signature, type your name in full and any recognised qualifications you may have. Then on the next line, add your job title and company. Is this signature-on-a-website tactic relevant for all businesses? In my view, adding a signature onto a website is a worthwhile tactic for all small business, whether you’re a solopreneur, or have a handful of staff. After all, why wouldn’t you want to build trust on your website? It’s simple, deceptively powerful – and very cheap to do! Also, it’s a tactic that’s relevant for all types of industries, whether you’re business-to-business, business-to-consumer, selling products, or selling services. Even large corporations can benefit from this approach. Just look at how Richard Branson has plastered his name over his various Virgin companies (encompassing airlines, trains, telecommunications/internet, record label, wine merchant, radio stations, financial services – and a whole lot more besides). By adding his name (and the flamboyant personality that goes with it), the Virgin Group has a unique brand. The Virgin Group of companies have a very different vibe to their clinical-looking, staid, corporate competitors. Some of you reading this article will be appalled that I’m suggesting adding a signature to personalise your business. A common objection I hear to this tactic is, “but I want my business to look serious and corporate. Adding a signature and photograph just makes my business look small and amateurish”. During my time as a Marketing Consultant in the UK in the late 1990s (a time when the economy was strong), I met many business owners who did not like their business being called a “small business” or an “SME”… even if that’s exactly what they were. These business owners thought that it was all about size. Indeed, such business owners considered the use of the word “small” was an insult to their ego; to their stature in life; to their importance. Consequently, these size-challenged business owners wanted their marketing materials to emulate the corporates. Yes, they actually wanted their materials to be faceless! They wanted to focus on the “brand”, and not on people. What’s the result of “corporate-looking” marketing? All of these corporate-looking marketing materials were dull, faceless, bland and interchangeable. The copy was jargon-riddled nonsense. The photographs were generic stock library images. You would have struggled to tell one company’s marketing materials from the other! In these days where many small businesses are still struggling with the after-effects of recession, competition for your prospects’ share-of-wallet is tougher than ever. What’s more, with increased use of technology, many small businesses now have to compete against overseas suppliers (who are often able to supply at a lower cost), as well as local competitors. Business life is tough! So, in these days of hyper-competition, do you want your business to look dull, faceless, bland, and unmemorable? Or do you want your business to stand out; be unique and memorable; and start building meaningful relationships with your customers? It’s your call… but I know which approach is likely to yield the better results. Using your signature helps you stand out from your competitors. Based on my experience, I’d say that most of your competitors won’t have the balls to add a signature in such a public way, so that’s another thing in your favour! It adds personality and depth to your message, in a way that a logo by itself will never do. It lets prospects and customers know that there’s a real person behind the brand. Not only does that build trust and credibility, but it’s also the beginning of forming closer relationships. This is ridiculously easy and cheap to do! The key to getting more email newsletter sign ups online is to appeal to both Tentative Tom and Decisive Dan. The very first thing I do is to look at the client’s website to see if the sign up process will appeal to both Decisive Dan and Tentative Tom. I’ve written about Decisive Dan and Tentative Tom before, and how they behave differently online. In previous articles you’ve seen how you need to take both user types into consideration when structuring your website content, and also when creating sales pages. But you also need to take both of these website user types into consideration when you want more email newsletter sign ups. Here’s how you can get both Decisive Dan and Tentative Tom to sign up to your email newsletter. 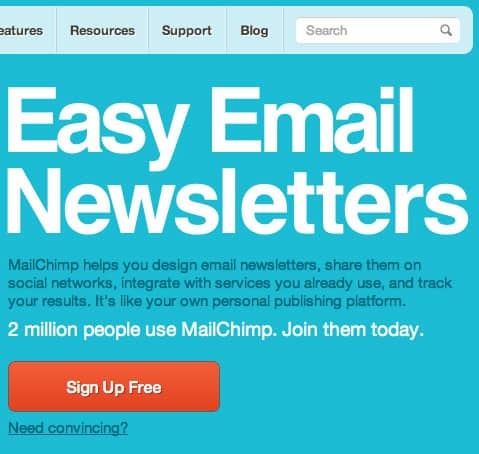 It seems that eeeeeveryone is offering email newsletters these days. And you have to earn (a) your place in prospects’ mailboxes, and (b) getting your newsletters read, rather than trashed. Recipients receive immediately. Instant gratification is key; if there’s a delay they’ll have forgotten about you. Therefore delivery needs to be automatic and automated (which is why email newsletter software such as AWeber and MailChimp is so neat, it does all that for you). Encourages foot traffic. Digital content isn’t suitable for all business types. Or you might want to do something a bit extra. For example, if you’re a retailer you might want to offer a digital “buyers’ guide” – but you might want to supplement that with a time limited offer to receive an in store consultation. Adds value to what you do. The freebie should be something that helps to answer a problem that all your prospects share. It’s something that’ll help them in their lives, and establishes you as a credible expert. Has enticing packaging. Packaging sells! 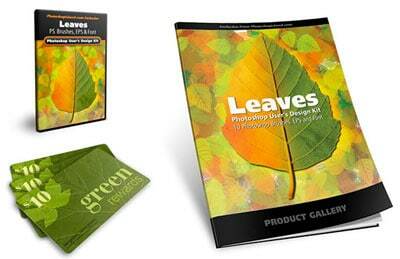 Even though you’re sending something digital, get a graphic designer to make it look like a real product. There’s special software (for example Cover Action Pro PhotoShop add-on) that can mock up books, CDs, DVDs, magazines, and a whole lot more. The business cards above aren’t real. Neither is the DVD case. Nor is the magazine. They’ve all been created by someone using Cover Action Pro. Both Decisive Dan and Tentative Tom will love this enticing packaging. There’s not much point in having a great freebie on offer, but it doesn’t look enticing. Give it some zing! 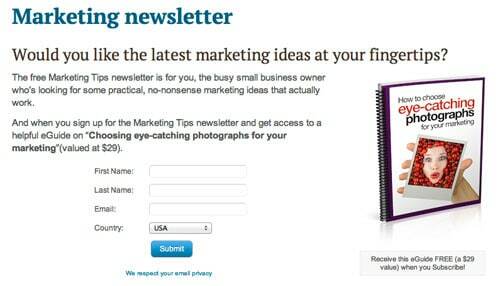 To entice Decisive Dan to sign up to your newsletter, you need to make it easy for him. And the best way to do that is to have a sign up form right there, on most pages of your website. This sign up box should be in a prominent position, rather than tucked away somewhere down the bottom. 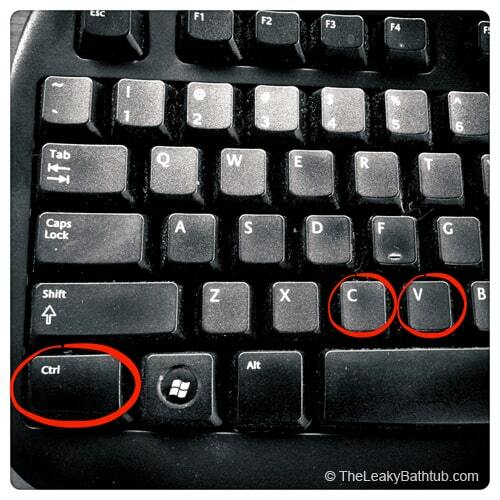 Very often, a Decisive Dan kind of person won’t scroll down the page, so you need to make it obvious! A good way to make the sign up box obvious is to feature it prominently on every web page. My preferred space is at the very top of the right hand column (side bar), so that people can see the sign up box without having to scroll. 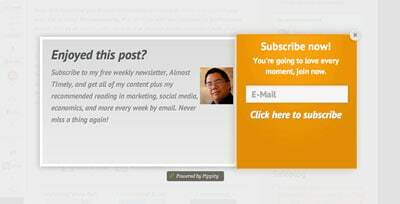 To attract as many email newsletter sign ups as possible, this box appears on most pages of my website. My sign-up box is quite subtle (I’m not into garish colours!). It’s not the prettiest looking website (or sign up box), but Randy Ingermanson has more than 30,000 email subscribers, so it definitely works for him! There are other techniques you can use to grab Decisive Dan’s attention. These include pop-up boxes, which can be programmed to appear immediately when someone visits your site, or after a set amount of time. I was happily starting to read a website article when this pop-up sign up box came up, blanking out the rest of the page. 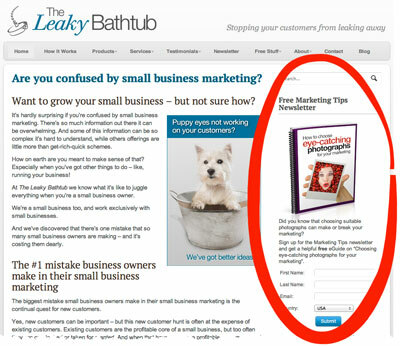 Many websites use this as a ploy to capture more email subscribers. Personally I don’t like these pop-up boxes, they really annoy me… though apparently they do work well. I don’t want to inflict them on my readers, seeing as I dislike these pop-ups myself! But there’s a subtler way to grab Decisive Dan’s attention, and that’s with a Hello Bar. The ‘Hello Bar’ is the bright horizontal strip across the top: this is an obvious but still subtle way to get users to take action, e.g. sign up to your email list. 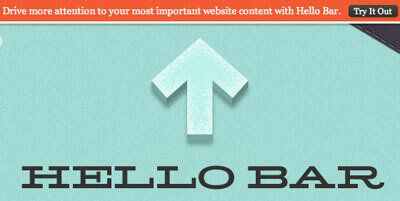 The Hello Bar lets you use any call-to-action you like (be it a newsletter sign ups, or whatever). You can use colour to make it stand out, yet without being too garish. And it can stay at the top of the screen even when people scroll. The Hello Bar is visible at all times, even when people scroll down the web page. So there you have it: Decisive Dan wants it to be as easy as possible to sign up. He likes the sign up box to be attention-grabbing and with no excess information or blurb to hold him up. Be assured that your newsletter is worth receiving – and including testimonials from other newsletter subscribers will help to sway him. Get an idea of how often you’ll email him. Of course, you can change the frequency, but it’s nice for people to know if you’ll be emailing them daily, weekly, fortnightly, quarterly, etc. Wow, that’s rather a lot of information! Far too much to fit into your sign up box. That’s why it’s worth having an extra web page with more details. Notice how I have a little link in the sign up box on my website? The newsletter sign up box on the right-hand side bar of my website includes a link to web page with more information on my newsletter. This is for Tentative Tom! That link is there especially so that Tentative Tom can find out everything he wants to know. The link goes to a special page that answers all his questions; gives some reader testimonials; – and yes, there’s another sign-up box there too. If you don’t have a special newsletter page, it’s harder to drive people to your site for the specific purpose of signing up. So there’s two-fold benefit for having this separate page: it encourages Tentative Tom to sign up, and you have a page that you can link to. This is my main email newsletter sign up page: it’s a very good idea to have a dedicated page you can link to. Notice how the sign up box is visible without scrolling; this is for Decisive Dan’s benefit, in case he ends up on this page. By scrolling down, Tentative Tom will be able to read more about the email newsletter subscription to put his mind at ease – and entice him to sign up! 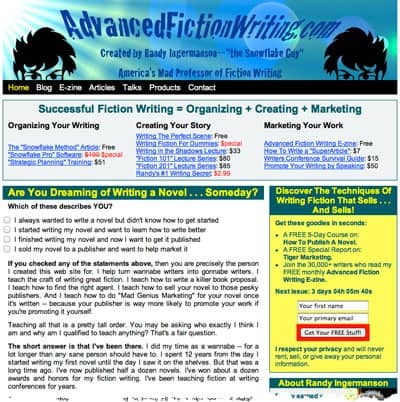 I actually have two email newsletter sign up pages on my website. Notice how the one above talks (unsurprisingly) about the newsletter? Well, sometimes I don’t want to promote the newsletter; I want to promote the free eGuide. For example, the reverse of my business cards talks about the free eGuide. 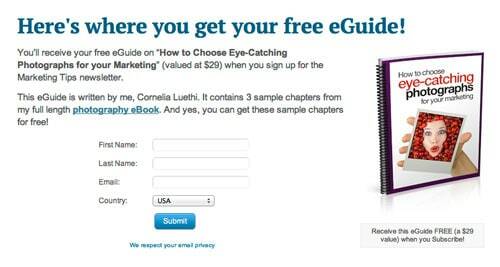 If I pointed these people towards the page above, they’d be confused, because the connection between the newsletter and free eGuide isn’t obvious at first glance. (Well, not to Decisive Dan, anyway.) Because the connection isn’t instantly obvious, it would make people scratch their head. And that’s dangerous, because while they’re scratching their head with their left hand, their right hand is hovering over the mouse to hit the ‘back’ button and navigate to some other website. Therefore we need to avoid that head scratching! And that where this second page makes a useful landing page. 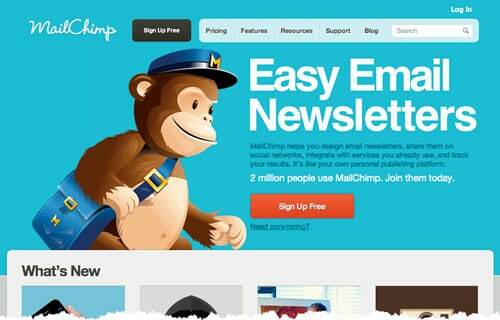 This sign up page has more emphasis on the free eGuide, than on the email newsletter. 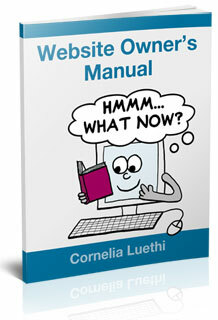 This makes it a useful landing page for when I’m promoting my eGuide. I’ve found it incredibly handy to have two different newsletter sign up pages, and I suggest that you do this too. You can even start measuring to see which page gets the best conversion rate, and learn from that. 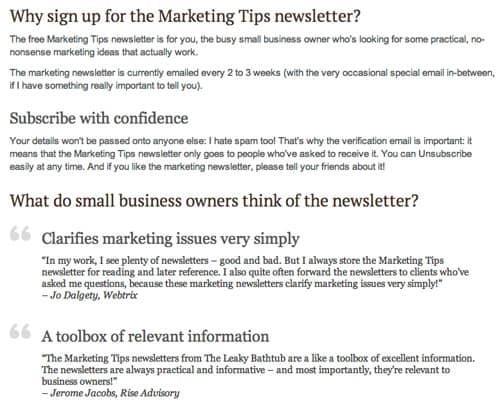 Have two slightly different detail pages (one focusing on the newsletter; the other focusing on the incentive) give you extra flexibility in your marketing. Once you’re sure that your website is set up to maximise email newsletter sign ups, your next task is to drive more traffic to your website so you can start growing your list in earnest. 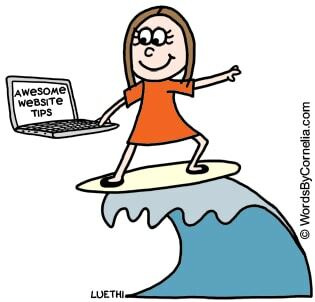 Next step: like these website tips? At last! 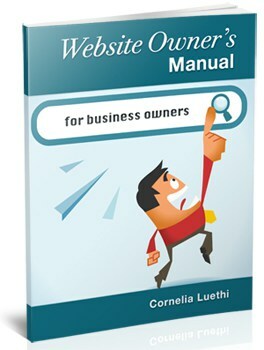 Easy-to-read and plain-speaking tips to help you get to grips with your website. Website updates: How often should you update your website? And what on earth could you possibly add to it? Conversion: What tweaks could you make to your website to turn more visitors into customers? Links: Why is it important to have quality websites linking to your website? And how can you go about getting these links? Communication: How can you communicate with your customers online? And what sort of content could you use? Measurement: What exactly should you be measuring? And how? Real world strategies: What can you do in the real world to encourage people to visit your website?